It really is sad. He had a very large number of fans visiting him regularly. 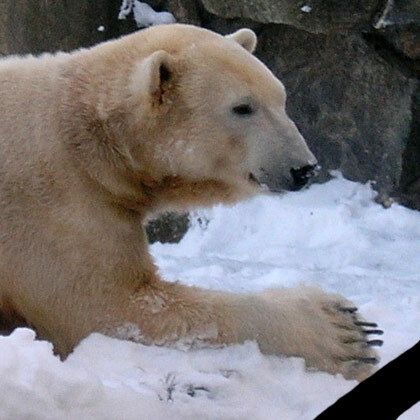 It will probably also be a devastating blow for the Berlin Zoo. "He generated millions of euros (dollars) for the Berlin Zoo in lucrative merchandising and extra entrance fees. Twice-daily appearances allowed the public to watch Knut splash in a pond, jump on rocks and play with his handler, who had carefully removed the newborn from his aggressive mother's cage. The cuddly white cub sent Berlin Zoo's shares soaring to an all-time high on the Frankfurt Stock Exchange as visitors queued in their thousands to watch him play. Stuffed toy "Knut" bears sold out several times over, the cub made it onto the cover of glossy magazine Vanity Fair and Hollywood superstar Tom Cruise and his daughter Suri came to visit him, as did Leonardo DiCaprio."